"To perpetuate and restore native animal life within New York State for the use and benefit of current and future generations, based upon sound scientific practices and in consideration of social values, so as not to foreclose these opportunities to future generations." As part of its mission the DEC keeps (confidential) records of known rattlesnake dens, as identified by experts in the field. Over the years there have been many reports of timber rattlesnakes in the vicinity of the Williams Lake property. Most of these have been made by casual hikers and others who are not trained in the recognition of specific snake species. As a result, the DEC has routinely discounted such reports, preferring either expert identification or hard evidence, such as photographs. 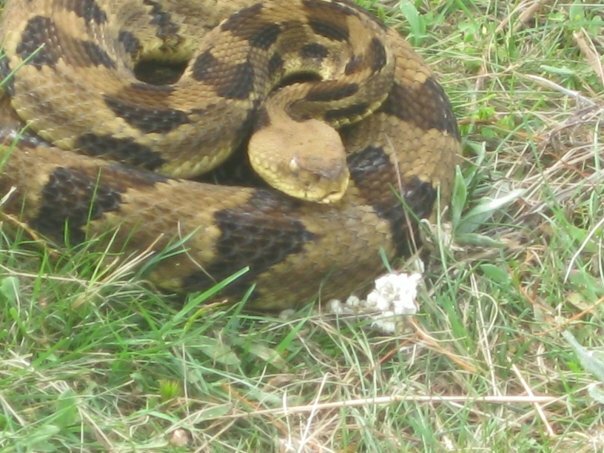 In April of 2012 such a photograph was taken by one of two people who encountered a timber rattlesnake in the area of the Williams Lake property on which a hotel lodge and a cluster of hotel villas have been proposed. The photo, information about the location where it was taken, and contact information for the reporter were provided to DEC, along with a request that an expert survey for timber rattlesnakes be conducted and that they be included in the Incidental Take permit applied for by HRVR (which addressed only the endangered Indiana bat). Timber rattlesnakes are shy, generally avoiding humans when possible. Their coloring provides effective camouflage on the forest floor where they are typically found. Although they are venomous and their venom can kill a human if not promptly treated, bites from timber rattlesnakes are rare due to their reclusive nature. As a result, the snakes present little hazard to reasonably cautious humans. The opposite, however, is not true. Timber rattlesnakes reproduce slowly, so even small losses can be significant in reducing the presence of the species. Loss of suitable habitat represents a major threat to the snakes, which tend to remain within traveling distance (2-4 miles) of their home den throughout their lives. Disturbance of habitat within the Williams Lake property could place stress on rattlesnakes traveling from already-known dens in the area. Even more disruption to the species would occur if an undiscovered timber rattlesnake den exists near the proposed construction area, since this would have the effect of reducing the habitat of all the snakes in that den. A map showing the reported sightings in the area, including the most recent one, raises the possibility that such a den exists. That is why DEC is being encouraged to require an expert survey of the area, with a focus on the land between Fourth and Fifth Binnewater lakes. Last updated 19 Jan 2013.